You will now show each card individually to have backs on both sides. You do this by means of a diminishing lift sequence variation that will, no doubt, sound complicated, but which will become second nature with a little practice. Obtain a fourth-finger break above the bottom card by means of either a pinky pull-down or a buckle. Turn the top card of the packet over stud fashion, replacing it on top. (This will be the double-backer.) As soon as it's back on the packet, follow through by doing a multiple turnover of all the cards above the break (i.e., all except the bottom card). Finish by thumbing over the top card into your right hand. Do a single turnover (the double-backer), and then again turn over all except the bottom card. Now comes the one tricky part of the sequence. You must take the top two cards, as a double, into the right hand under the card you're already holding. I have found the most practical way is to pinky count to get a break under the two cards first. Now use the right-hand cards to flip over the top card of the two remaining in your right hand. (This will, again, be the double-backer.) Take this card on top of the right-hand cards in an injogged condition. It now remains only to show both sides of the last card remaining in your left hand. To do this, snap the card to emphasize that it's a single card» then place it on top of those in your right hand. 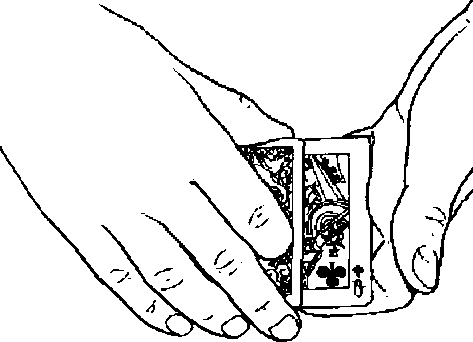 Transfer the cards to left-hand dealing position. Square up, taking a break under the injog. Now perform a double turnover. You've individually and convincingly shown each of the *four" cards to have backs on both sides. To achieve the best illusion, the above handling should be performed briskly in one fluid sequence and should be accompanied by some patter to justify the actions. I talk about each of the cards having a secret marking on only one side that allows me to identify them. Alternatively, you might talk about how you can tell the cards apart by small imperfections in the back designs. Any tongue-in-cheek patter that provides motivation for showing both sides of each card will do. At the conclusion of the last double turnover in the previous sequence, the double must not be allowed to land square on the packet. Rather, you must catch it momentarily at the base of the thumb. Your right hand then comes over and lowers the double onto the packet. During this action, angle the double very slightly so that it protrudes over the outer left edge of the packet for about a sixteenth of an inch. Illustration 1 shows a wormVeye view of this condition. Take the packet in your \ MSSfllfVV V MKi^SW H I.
where the left hand has been removed for clarity.) This action is the same as that of the familiar swing cut. 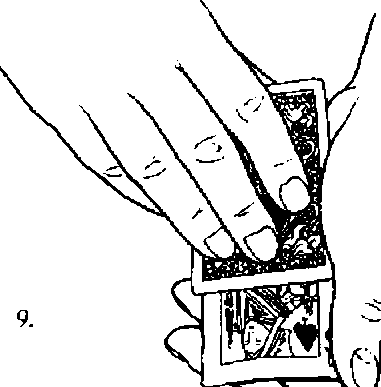 As the right forefinger swings the double over, however, the left thumb goes through the motions of peeling a card into the hand as in illustration 3.
contact the lower surface o( the double. queen face up on her palm. Flip the packet over. 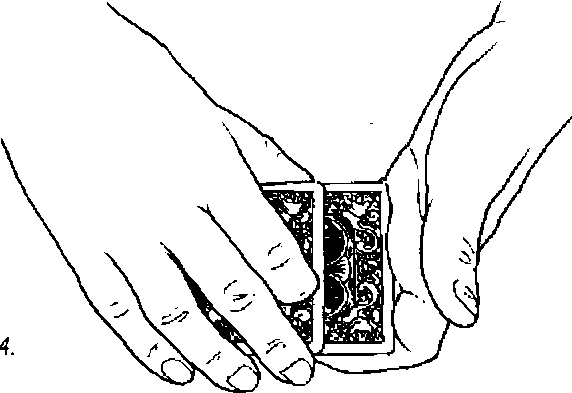 Thumb off the top card (the double-backer) and hand it to a different spectator to examine. While he is doing so, obtain a break above the bottom card of the packet. Take the packet in your right hand in Biddle grip, the thumb taking over the break. Retrieve the double-backer from the spectator with your left hand and place it on the bottom of the packet, sidejogged to the left for half its width. Turn your right hand palm up and then palm down again. Once moreT two backs will show on either side. The thumb break should be as small as possible and as close to the inner right corner as possible so that it doesn't show when you turn your hand over. When I turn the hand palm up, I also press against the bottom of the packet at a point near the thumb end to squeeze the break as small as possible. This action, which should appear simply as a pointing gesture, is shown in illustration 6. 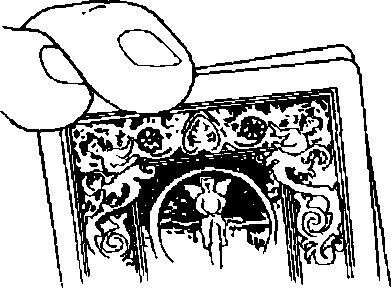 Once the hand is palm down again, press your left thumb against the left edge of the sidejogged card; the entire edge of the card should touch the thumb from tip to base as in illustratiim 7. 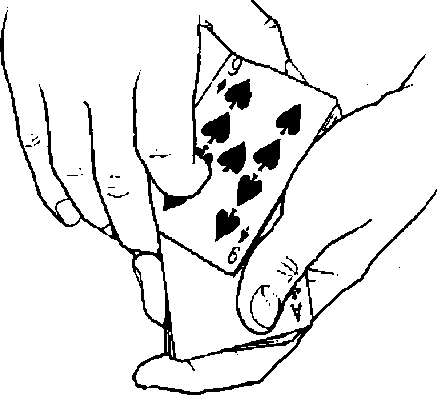 The left forefinger is bent under the cards and the second and third fingertips press against the right edge of the packet while the fourth linger engages the card below the break, illustration S shows this position from below. Squeeze the left hand closed so that the double-backer slides square under the packet and aligns with the card under the break. (The two cards will momentarily bend slightly convex along their length.) Immediately draw the two cards into view, now show ing as a queen, and place the double on top of the packet. In a continuing action take the packet into left-hand dealing grip and thumb off the top card. Place it top of the other queen on the spectator's hand. The above change is a slight variation of a move from Father Cyprians Wild Card in Frank Garcia's Super Subtle Card Miracles. The card goes out of sight so briefly that it looks like you visibly print a face on it. satisfied, retrieve it and place it under the right-hand double, sidejogged to the left for half its width. Turn your left hand palm up and palm down to show two backs on either side. Your left hand now contacts the cards exactly as in the previous change, thumb against the left edge of the card and fingertips against the right edge of the packet. This time, however, you're not holding any break. Close your left hand to square the three cards together. Instantly your right fingertips draw the top card back to reveal a third queen. At the same time your left hand should give its cards a slight squeeze to ensure alignment of the double along the sides. (See illustration 9.) In a continuing motion, slide the top card forward and to the right and grip the cards in the right hand from above, the double sidejogged to the left; this action ensures alignment of the double along the ends. 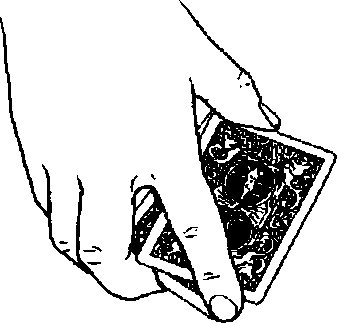 Take the double in the left hand in dealing grip and slide it on top of the right-hand card, sidejogged to the left. Your left hand now retrieves the two other queens and drops them on the face of the double. Use the bottom card (which is sidejogged to the right) to flip the other cards face down into left-hand dealing grip and, in the same motion, drop the card on top oi them. Take the packet in the right hand in Biddle grip. Spread the cards by sliding out the three bottom cards with the left fingers. This will show four cards, the top one of which is actually a double. Turn your hand palm up as you comment that there is only one card left to print. The audience will see three queens and a back (presumably the remaining double-backer). Turn your hand palm down again and take the spread in your left hand, clipped by the thumb. Grip the double at the end of the spread with your right fingers and thumb and flip it over exactly as you would normally perform a double turnover. At the same time, square all the cards into dealing position. Hand the top card, the double-backer, to a spectator for examination. However, in order to hide the face-up card second from the top from the audience you must do two things. First, you must take off the top card with a hit double lift action. Your right first and second fingertips strike the inner right side of the packet and pry up the top card. (To thumb it off would expose the face-up card under it.) Second, you must do a wrist turn (i.e.. turn your left hand palm downward to take the top of the packet out of view) as the card comes off. 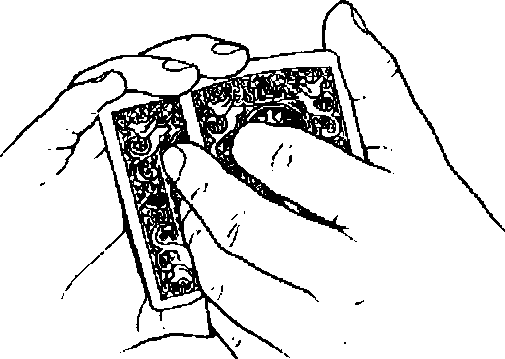 While the spectator is examining the double-backer, take the cards you hold into a face-up spread in your right hand, the bottom card actually being a back-to-back double. Simply push off the face card and take in the right hand, push off the next card and take it under the first, sidejogged to the left. Finally, take the double under the first two cards, sidejogged to the left. Retrieve the double-backer from the spectator with your left hand. Use the right-hand spread of cards to tap the double-backer and then to flip it over. Act surprised when no face appears. Do this once or twice more. Finally, tell the audience that you'll have to try something different for the last card. The above sequence serves two purposes. First, it impresses on the audience the picture of the cards as consisting at this point of three printed cards and one undeniably double-backed card. Second, it gives you an excuse to retrieve the double-backer from the spectator so that you can then hand it back to her after you've switched it. Take the double-backer under the spread. Square up the cards and turn the packet over. Take the packet in right-hand Biddle grip and spread the cards by sliding the out the bottom three just as you did earlier. Turn your hand palm up. Just as before the audience sees three queens and what they perceive to be a double-backed card (actually a double consisting of both the double-backed card and the remaining queen). Turn your hand palm down again and take the spread in your left hand, clipped by the thumb. Ask the spectator—the same one who last examined the double-backer—to hold out her hand palm upward. Grip the double at the end of the spread with your right fingers and thumb and flip it over exactly as you would normally perform a double turnover. At the same time, square all the cards into dealing position. Immediately thumb off the top card—no need for a wrist turn this time—and place it on the spectator's palm. (YouH find this sequence gives a very strong illusion of showing and taking a double backer.) Without letting go of the card, ask her to place her other hand on top of it. Let go of the card just as her other hand descends on it. 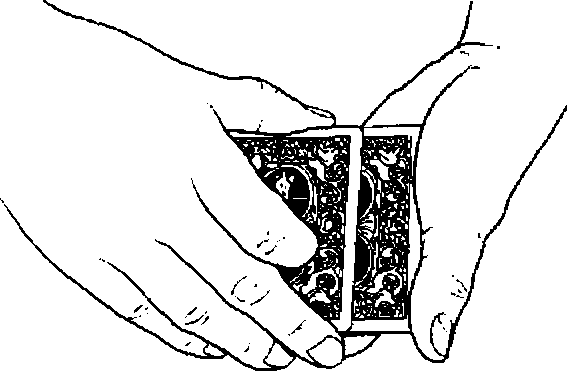 Take the remaining cards into a face-up three-card spread in your right hand just as you did earlier and use the spread to tap the spectator's hands. This action echoes the earlier sequence and recalls the earlier picture. 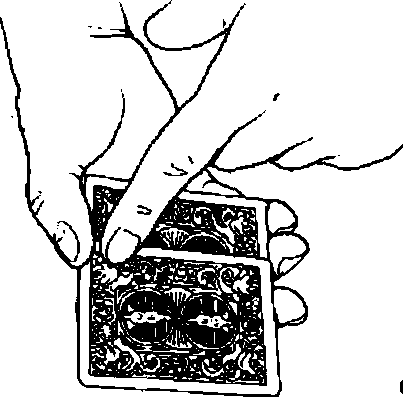 The fact that the audience sees three queens reinforces the notion that the card between the spectator's palms must be the fourth card they saw before, the real double-backer. Close up the spread and hold it face up in your right hand in Biddle grip. Have the spectator show her card to the audience to reveal that it is now the fourth queen. While she is doing so, clean up as follows. Transfer the face-up packet to your left hand. 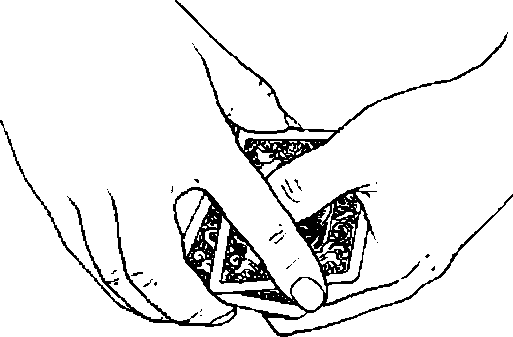 As you do so, push the bottom card (the double-backer) into the right palm using the palm change steal explained in Hitchcock, Travelers. Reach into your right front pants pocket and remove the coin envelope, leaving the palmed card behind. Drop the envelope on the table (or clip it between your right third and fourth fingers if no table is available.) Retrieve the fourth queen from the spectator. Slip the queens into the envelope and give them to the spectator as a souvenir.